Backhoe Joe | What is ML Reading? 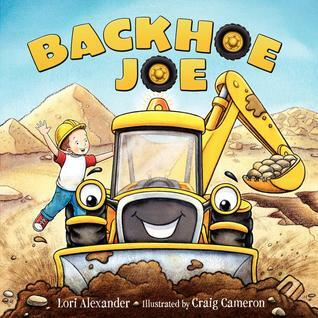 Backhoe Joe by Lori Alexander and illustrated by Craig Cameron – “A young boy tries to adopt a backhoe. When Nolan finds a stray backhoe in the street, he can’t wait to adopt it. But this backhoe is not very well behaved. As Nolan tries to train his new pet, he learns that maybe this backhoe already has a home. All children ages two to five are mesmerized by heavy machinery. One morning before my preschool story time, a crane was being used next to the library parking lot. I knew I couldn’t compete. To my relief, it left the premises five minutes before people arrived. In a few months, our library will be renovated. I plan to read books about construction at the last story time. This book is first on the list. It’s not your typical heavy machinery book. There’s a well developed plot; and the illustrations are amusing. An important note to parents. Yesterday, I wrote about it being important to read princess books to boys. It’s just as important to read backhoe books to girls. In the picture book world, there should be no such thing as a boy book or girl book. This entry was posted in Picture Book and tagged Backhoe Joe, Craig Cameron, Lori Alexander by mlreads. Bookmark the permalink. Looking forward to reading more books by you in the future. Congratulations on your first book.